I got it! 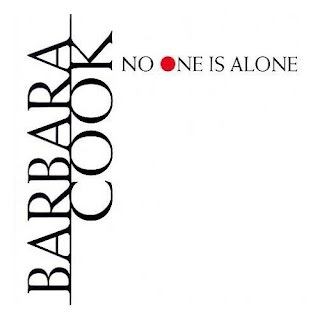 Barbara Cook's 17th and latest album, No One Is Alone is out and I got it! It's the material, mostly new to her, that she has been touring lately. We saw her perform this set list at Carnegie Hall last November. Her voice is so warm and really, there is absolutely no better storyteller. It's a fun listen, but even better it's heartwarming and gorgeous. It's a bonus that Kelli O'Hara and Sebastian Arcelus joined her in the studio recreation of Make Our Garden Grow that they did at Carnegie. She's still not my thing, but that cover is FABULOUS.